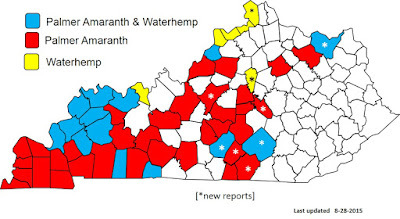 Glyphosate-resistant Palmer amaranth (Amaranthus palmeri) and waterhemp (Amaranthus tuberculatus) continue to spread across Kentucky. Initially these pigweed species were thought to be present primarily in the west end of the state (Purchase area and along the lower Ohio River region), but have now been found in over 50 counties throughout Kentucky. These sightings would indicate that Palmer amaranth and waterhemp continues to be a growing threat to grain crop production within the state. It appears that the introduction of these weeds on farms have come from a variety of sources. The seed size is extremely small which allow seed to be easily spread. It is known that some Palmer amaranth seed was introduced when cotton seed hulls were fed to livestock and the subsequent manure spread on crop fields. Other possible routes for introduction can be from purchasing used combines, headers and farm equipment from other states; trucks hauling supplies from the southern regions of the US where Palmer amaranth is widespread or the Midwest where waterhemp is more prevalent; or transport of farm equipment from farm to farm. Another source appears to be through planting cover crop seed that is not inspected or cleaned of unwanted weed seed. US-EPA Grants Section 18 Emergency Exemption Label for Use of Transform™ WG for Control of Sugarcane Aphid on Grain Sorghum in Kentucky. The United States Environmental Protection Agency (US-EPA) has granted the use of Transform™ WG for control of the sugarcane aphid, (Melanaphis saccahri) on sorghum. A Precision Ag Data Collection Workshop is scheduled for August 24 and August 25, 2015 at the Kentucky Soybean Promotion Board Office in Princeton, Kentucky. The endeavour is part 5 in a series. Dr. Joe Luck at Nebraska (and a UK grad) is coordinating the workshop. Other speakers include Dr. Mike Sama and Dr. Josh McGrath (both at the University of Kentucky). Dr. John Fulton at Ohio State and Dr. Brian Luck at Wisconsin (both UK grads) will also be presenting. The session is $25 and space is limited. Please register your spot. Sugarcane aphid (SCA) has been collected in two western Kentucky (KY) Counties. County Extension Agents Ben Rudy in Fulton Co. and Trent Murdock in Graves Co. have collected SCA from grain and sweet sorghum respectively. Identity was confirmed by Dr. Lee Townsend, Extension Entomologist, with the University of Kentucky (UK) in Lexington. Thus far, only the two infestations have been reported. The infestation in Fulton Co. is below treatment threshold, but the infestation in Graves Co. is much larger. Regardless of size, this does confirm that this new sorghum pest which likely migrates in from the Deep South can reach Kentucky during, if late, in the production season. Sugarcane aphid is a threat to all forms of sorghum (grain, forage, sweet) and will infest many other grasses including Johnson grass, which can act as a host for reproduction and a source of infestation.